Barack Obama was re-elected. He’s basically a soft-core Marxist. His radical views didn’t sneak up on and outwit an unsuspecting populace; unlike in 2008, they knew what they were voting for. They knew he’d bulldozed his nationalized (= socialist) health care plan into law without a single Republican vote. (So much for bipartisanship.) He didn’t win in a landslide, but he did garner a lion’s share of votes. Mitt Romney (despite his obvious weaknesses) didn’t run a bad campaign. A slight majority of voters simply prefer Obama. This means, among other things, that we have a cultural problem, not so much a political problem. 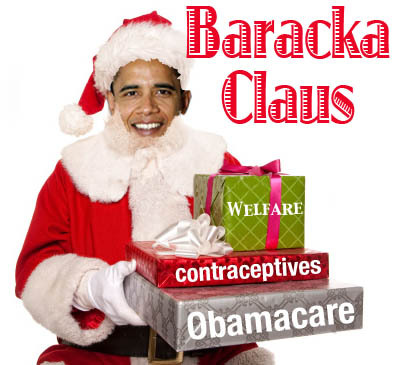 Obama is a political Santa Claus, and we now have an entire generation of chimney-riveted voters who blithely support social engineering by confiscatory wealth redistribution (i.e., stiff taxes), yearlong Christmas gifts from the wealthy few to the avaricious many. There is no quick solution to this problem. One reason for the depth of the problem is that ours is an obvious case of supply-and-demand politics: as long as there is a demand for political Santa Clauses, candidates like Barack Obama will be keep traveling down the national chimney. This is why excoriating — and replacing — Obama (understandable though this tack may be) is insufficient: there are plenty where he came from. Winning the war on socialism is analogous to winning the “war on drugs”: it’s a demand problem, not a supply problem. Political change is one effect (not the only one) of cultural change. Somebody recently told me that presidential elections are quadrennial snapshots of the culture’s continuously rolling video film. Elections are quick cultural verdicts at a specific point in time. It’s a great miscalculation to assume that elections produce long-term cultural changes; it’s cultures that produce long-term political changes. Cultural change occurs when people’s lives and worldview are changed, and the institutions they populate — families, schools, jobs, voting booths — are gradually changed. Cultural change is much harder and takes much longer than political change — which is why most people opt for political change. Fervent prayer is harder than precinct marching. Rearing children is harder than contributing to a political campaign. Attending church is harder than voting. Reading and obeying the Bible is harder than reading and discussing National Review. There’s the cultural way and there’s the political way. The hard way is the right way. And the ultimately most successful way.